We have this used two part square white meeting table in stock at present, which you can view more accurately by clicking on the images on this page. The table sits on a chrome tubular base. Dimensions: 1600 x 1600mm. 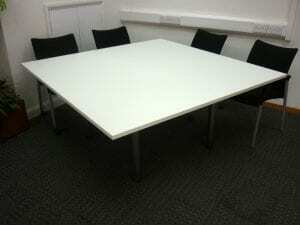 If you are unable to find what you are looking for, we have an extensive range of other Second Hand Tables in stock. Just click on the link provided, or simply enter your details into our ‘Request a Quote Online’ form below and one of our sales team will be in touch very soon.